An ultrasonic bone surgery system is indispensable when performing implant and oral surgery procedures. VarioSurg3, the latest advance in the VarioSurg range, maintains the lightweight and slim hand piece design of its predecessor and the same excellent balance and grip, but has 50% more power than the previous model. The feedback and auto-tuning functions are combined with a wide range of tips to ensure faster, more precise treatments. VarioSurg3 also features the world’s first dynamic link feature, which enables clinicians to operate both VarioSurg3 and Surgic Pro via a single foot control. Intuitive controls and a large and clear backlit LCD screen, makes VarioSurg3 really easy to operate and takes the strain out of delicate procedures. 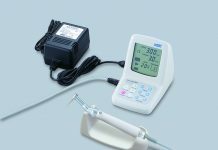 The Feedback Function constantly monitors the performance parameters of the ultrasonic unit during operation and simultaneously controls the power output, to optimise the level of power depending on the procedure. The NSK Link Stand provides the ability to conveniently link the Surgic Pro to the VarioSurg3 and provide operation with a single foot control, creating a compact and all-encompassing surgical treatment centre. The user-friendly display clearly indicates which system is active and ensures safe and accurate operation. Accurate, hands-free programme adjustments can be made via the foot control, all functions are clearly marked and by using the optional metal bar, the unit can be easily re-positioned at any time. 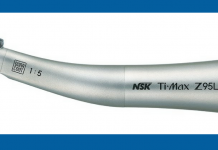 NSK’s unrivalled commitment to engineering innovation has resulted in a range of surgical products perfectly designed to meet the exacting needs of implant dentistry where accuracy, speed, torque and control are vital. 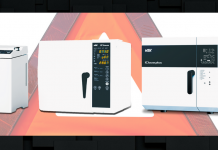 These are all delivered through the clean lines and ergonomic design of the Surgic Pro and VarioSurg3 systems that efficiently deliver all the key factors that contribute to successful implant and oral surgery treatments.